By learning what is xeriscaping, we learn more about sustainable living solutions. 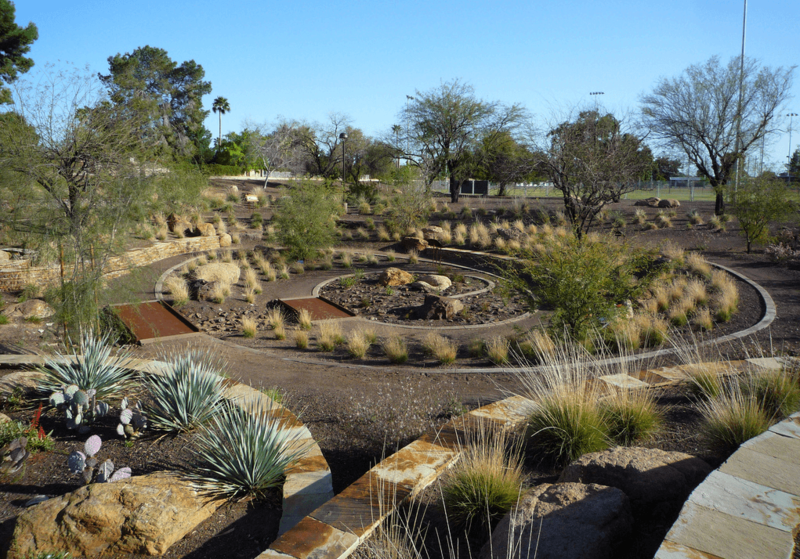 Xeriscaping relies on conserving water. This is a type of gardening which consists in depriving your garden of water but without leaving it completely dry. The concept of conserving water is crucial when you want to lead a greener life. Recycling, reusing and conserving are part of it. Furthermore, some cultures really value water, seeing it as a living entity. You can conserve water in your garden in a lot of different forms. Eco-enthusiasts prefer to use xeriscaping. The term comes from the Greek word xeros that mean dry. Generally, people use it in areas which have limited access to water. Numerous communities encourage the use of xeriscaping due to the ability to save money and due to its benefits. Xeriscaping or xerogardening reduces the need for irrigation. However, you can efficiently use it only in drought-tolerant landscaping. This gardening method does not only diminish water consumption, but it also leads to a lower maintenance yard since plants which require less water usually grow a lot slower. If you are interested in developing your own xerogardenig, we will provide you a wide list of drought-resistant plants and trees which can help you lead a green life. Xeriscaping is a gardening method which is environmentally friendly while also bringing a lot of benefits. This water conservation concept has originated in Colorado, and it managed to spread throughout the west. The main purpose is to save water by developing water-efficient landscape designs. If you live in a dry area, you may come across all sorts of water-resistant plants which have adapted to the weather conditions and the landscape. Hence, native plants can be low maintenance. Furthermore, your lawn will only need a trim once or twice per year. Hence, you will need a lawnmower on a very hot day. One of the biggest benefits when it comes to xeriscaping is that you can save water. Hence, you can benefit the environment. You will need less water to maintain landscaping. Since you live in a dry area that allows implementing this method, you have to consider that the water resource should be cherished and well-preserved. By preserving water, you actually benefit the environment. It is clear that by saving water, you also save money on your bill will no longer be as costly as before. Besides the fact that the water bill will be lower, you will also save more money because xeriscaping products are less expensive. A green lawn looks very nice, but it won’t look natural in a dry area. Hence, a blooming desert plant in some rocks will look natural and just as beautiful. Besides the benefits, when you choose xeriscaping, you have to also select the right plants for your garden. It is better if you choose plants that are native instead of choosing other luxurious plants which necessitate a lot of water to maintain them. Native plants will have better chances of surviving in the climate conditions, also requiring less maintenance. These plants are able to adapt a lot faster to the natural amount of heat and rainfall in your area. Furthermore, local plants can also attract wildlife. Therefore, your garden will be populated by butterflies and bees. Consider choosing drought-tolerant plants which can easily grow and thrive using less water. Drought-resistant plants usually are those with tuberous roots or tap root systems. Specialists indicate that plants with thick rubbery leaves and gray foliage can also adapt with great ease to dry areas. Another important thing when using this type of gardening is related to the place you plant your flowers and shrubs. You should consider planting near one another the plants which have similar watering needs. In this way, you will be able to prevent over-watering, and you will not even need to water areas of your garden which do not necessitate watering. If you plant green grass, you should know that this really depends on water to thrive. Therefore, you should consider placing your lawn area near decorative gravel. Besides the fact that it will continue to look amazing, it won’t need as much moisture as grass does. Many gardeners who live in dry areas of the globe have been implementing some of these principles for years. Xeriscaping is suitable is mainly in the western half of North America. There, gardeners depend on irrigation since little rain falls in summer. This idea has spread starting with 1981. Back then, the Denver Water Department had developed this concept. It has developed the policy of xeriscaping in order to deal with the West chronic water shortages. Furthermore, gardeners in the East were also inspired, and they have decided to use mesiscaping. They live in areas of mostly dependable rainfall, but they can earn more benefits if they implement mesiscaping. This means that they can plan their garden with moderate water use. When you decide to implement xeriscaping, you have to make sure you establish your yard’s types of soil and microclimates. Furthermore, you have to be very careful when it comes to the areas in your yard which stay moist longer and the areas which dry out faster than you have estimated. When you map your yard, you have to plan the zones considering high, moderate and low water use. If you live in a dry area, learning what is xeriscaping can be extremely useful to develop your garden accordingly. Besides the multitude of benefits, like saving water and money, it also greatly benefits the environment. If you plant local flowers, trees, and shrubs, they will be more likely to thrive in this area, being accustomed to the weather conditions.